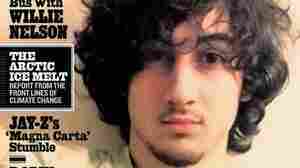 July 17, 2013  The magazine hasn't hit newsstands, but some say it glorifies alleged Boston bomber Dzhokhar Tsarnaev. Rolling Stone's editor stands by the use of the photo to help tell the story of "an incredibly normal kid" who turned into "a monster." June 22, 2010  Gen. McChrystal will have President Obama's 'undivided' focus at their meeting, Robert Gibbs vows.